A lot goes into deciding on your dorm room decor for the holidays. If deciding on your dorm room decorations for the college year was tough, deciding on how you want to dorm room decorate for the holidays is even harder! You need a dorm Christmas tree that is perfectly sized for your college dorm room. You also want your holiday dorm room decorations to have cool looking style. You don't want your college dorm room decorations for the holidays to look like everyone else's, after all. To start your holiday decorations off right, begin with our Purple Fir Tree with Mini Lights. Our Purple Fir Tree has pretty purple branches that you can't look away from. Your dorm Christmas tree is going to be the centerpiece of your holiday dorm room decor, so having this eye catching dorm essentials item in your college supplies is a great beginning for one of kind dorm room decorations for the holidays. This dorm necessities item doesn't just have pretty purple branches. 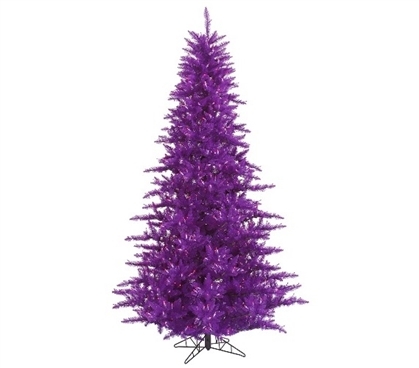 This dorm item also has purple dorm mini lights on purple wire right on the branches! Plus this college Christmas tree is compact, allowing you to decorate your college dorm room without losing all of your dorm floor space.